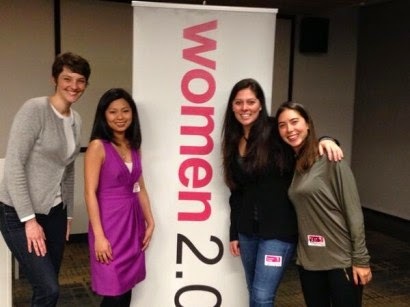 I learned about Women 2.0 back in 2007 via a blog post by Sarah Tavel. I was living in Los Angeles at the time, and Women 2.0–along with all of the other writers of the blogs I was reading–was based only in San Francisco. I was already buckled into the tech startup bandwagon, but this particular post about a napkin startup pitch competition gave me the serious case of FOMO that eventually brought me to the beautiful, meteorologically erratic city of San Francisco. After experiencing the transplant initiation frenzy of attending every Eventbrite and Meetup.com happy hour I could find, I wanted more involvement and got in touch with Women 2.0 about volunteering opportunities. Soon after, I was told they needed help officially launching Founder Fridays (newly re-named City Meetup) in San Francisco. I’ve been organizing the Women 2.0 San Francisco monthly meetup events for more than two years now and have seen them launch in 20 cities worldwide. We’ve had more than 25 different female founders (Julia Hartz of Eventbrite, Ruchi Sanghvi of Cove/Dropbox and Jen Pahlka of Code for America, to name a few) speak at our San Francisco events and meet with attendees one on one. I’ve seen a number of attendees get jobs from people they met at the events, I remember one attendee in particular who got a job at TaskRabbit after meeting the founder who happened to be a speaker at the event. Beyond meeting people who’ve contributed to my consulting practice, I ended up meeting one of my best friends, a female engineer at Cloudera, at an early event. She’s my go-to tech and startup event companion and we’ve shared countless life memories since, including Burning Man. I met two of my co-organizers, Salem Kimble and Kate Rohacz, through subsequent Founder Friday events. I actually met my other co-organizer, Kathie Green, while on a flight to SXSW a few years back. The ephemeral nature of working in startups makes it difficult to find consistent mentors, so we have regular career coaching happy hours to bounce career-based issues and thoughts off of each other. It’s fantastic to know a group of women who make a point of creating sources for this, and it’s pretty logical that I found them through these events. This is basic, but it’s the part that many attendees I’ve spoken with (and myself) tend to have the hardest time remembering. Business cards are like that pair of jeans you keep because you think you’ll eventually fit them, but they just end up unused in the back of your closet. Once I take the effort to use any business cards I get, I end up learning the most interesting things about the person, far beyond our initial conversation. Usually, talking to about five women at an event leads to at least one relationship that continues beyond it, as long as I follow up. Lastly, in an elegant full circle, I ended up meeting Sarah Tavel at one of our events a few months ago. I’d invited Christine Lemke to speak and Sarah showed up to support her. As a result, I got to hear about how she’s liking the startup world at Pinterest and we discussed how we had some company projects in common. Despite constantly reflecting on how many ridiculously smart people live in San Francisco, I’ll never get over how easy it is to meet someone awesome, by just talking to a handful of new people every month. It also really helps that attendees at our events are self-selected in wanting to meet other women who also think about innovation and technology in their free time. JOIN US FOR OUR NEXT CITY MEETUP IN SAN FRANCISCO. RSVP HERE.